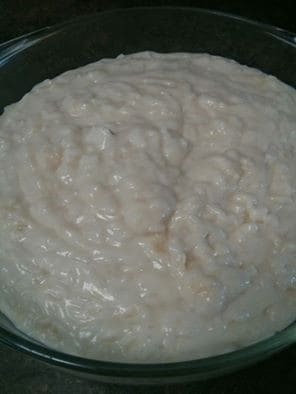 Combine cooked rice, 1 1/2 cups milk, and salt in a saucepan over medium heat; cook and stir constantly until thick and creamy, 15 to 20 minutes. Don’t try to cut this time sort, and don’t stop stirring – this is what gives you that perfect creamy consistency. Temper the beaten egg into the mixture slowly. Then stir remaining 1/2 cup milk and white sugar into the rice mixture, stirring continually. Continue cooking until egg is set, 2 to 3 minutes. Remove saucepan from heat; stir butter and vanilla extract into the pudding. You can add raisins, cinnamon, or allspice if you’d like. It’s delicious just as it is, too. Even on a scorching hot day, my family is gobbling it up! I’m glad I made a double batch.